The post is brought to you by Janalyn Voigt. Escape into Creative Worlds. Author's Note: I researched medieval siege warfare for DawnSinger, book one in my Tales of Faeraven medieval fantasy series, since its world is based on 13th-Century Europe. 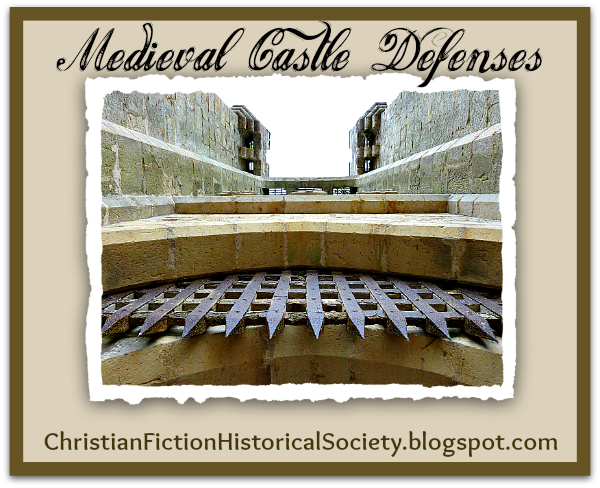 While I found the topic difficult to research (man's inhumanity to man has been going on a long time), castle defenses fascinate me because of the ingenious way function and design merged to create beautiful architecture. The architecture of the castle proved a strong ally to its inhabitants, which is why a siege could drag on for months without being resolved. A castle might be laid siege to (stormed in a direct attack) or besieged (starved out). Architects built castles to withstand extended warfare. One of the first considerations was location of the construction site. A castle built at the edge of a sea or lake could receive supplies by boat, a fact that made it challenging to besiege. Perching a castle on the brink of a cliff would make it impenetrable from that side. This strategy could have unfortunate consequences. Dunluce Castle, situated on the edge of a basalt outcropping in County Antrim, Northern Ireland. Part of the kitchen is said to have collapsed into the sea. Legend has it that only a kitchen boy survived, and that its mistress afterwards refused to live in the castle any longer. Motte-and-bailey and ringwork castles sat high atop what was usually a man-made hill. This gave the defenders among other benefits a good view of the surrounding countryside. Diverting natural waterways into ditches to surround a castle improved security, however besieging armies might patiently fill in portions of a moat with rubble in order to reach the castle walls. In medieval siege warfare, miners would tunnel beneath the corners of square towers in order to weaken and collapse them, thus breeching the wall. Defenders would watch the surface of water in bowls to warn them of mining activity. If they detected any, a counter-tunnel might be dug to collapse the enemy's tunnel. Round towers, which had no corners to collapse, were stronger. Stairways wound upward in the towers, always to the right. 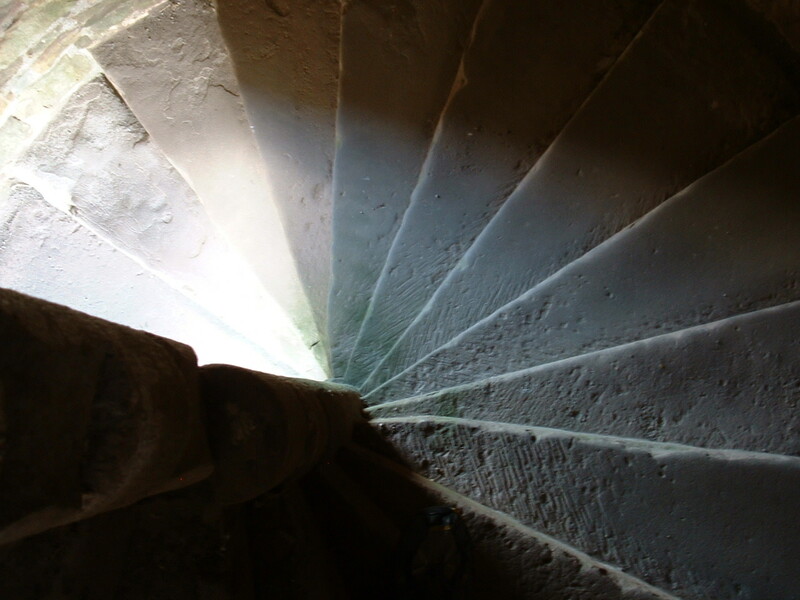 Since most people are right-handed, this put invaders climbing the stairs at a disadvantage. Their sword arms would be closest to the wall, whereas the defenders coming down the stairs to meet them would have their sword arms free. archers the ability to see out to shoot while exposing as little of themselves as possible to enemy arrows. 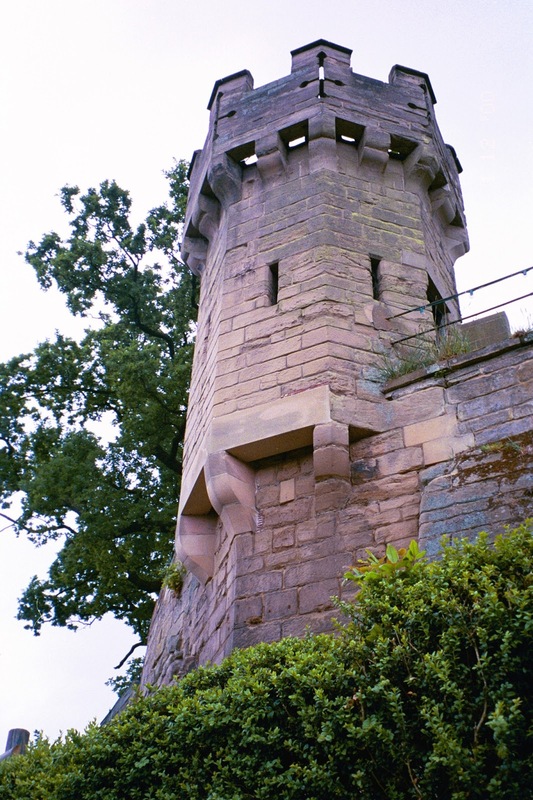 Crenellated (notched) parapets (a low wall or railing) built on top of walls. A defender could stand behind a merlon (the raised part) for protection, but step into the embrasure to fight. 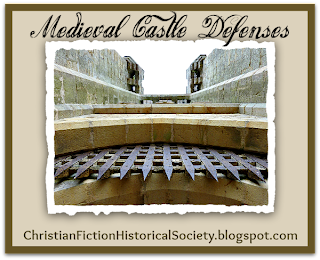 Made of iron or iron and wood, a portcullis (shown in the first picture, above) was a sliding gate with metal teeth that could come crashing down on an enemy, or if lowered would prove difficult to compromise. Often wooden doors were shut and barred on the inside of a portcullis as well. Two portcullises could close off a short hallway, trapping attackers in between. Through murder holes in the ceiling defenders would drop stones or pour boiling oil, hot water, or quicklime. Trap doors in the floor might burst open beneath attacker's feet. And archers could rain arrows in through arrow loops. 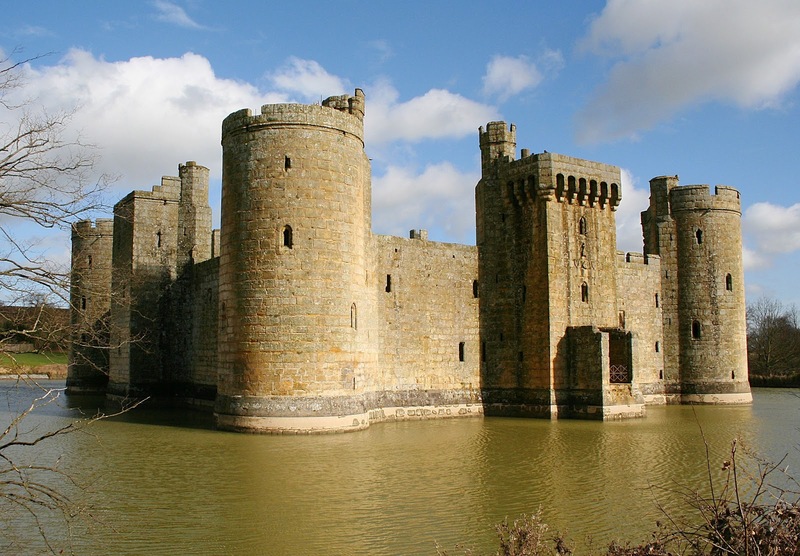 I can't hope to touch on all details (volumes have been written) in a single blog post, but these tidbits interested me and provide a glimpse into the practicalities of castle architecture. Click to read more notes from my research of Tales of Faeraven at Creative Worlds of Fantasy. Great stuff, Janalyn! I saw a picture of a castle in Ireland on a spire of rock out in the ocean. Looked like the only way in was through a stairwell just above the water accessed by boat. It sounds like you may have seen a picture of castle island. If not you really should search for a picture of it. I agree with your point, Pam. There's always a tension between freedom and security. That's why we need a Savior. I think that castle life and medieval times are fascinating. Reading about families battling families who live within walking distance of each other who constantly battle pretty much to the death for decades just breaks my heart. I know they're defending their homes but all the murdering and plundering is awful. And reading about how the castles were set up is so fascinating! Thanks for a great post! Thanks for commenting, Kam. Like you, I find castle architecture fascinating but wish its basis wasn't warfare. In the past week, I've watched 3 movies having to do with royalty in England. The castles were beautiful and fascinating. History surrounding all this wealth and beauty was not pretty. Thanks for this interesting giveaway and the chance to win a great read. So much for the notion of Medieval people as backwards and ignorant. Apparently our word to 'undermine' had some relation to tunneling under castles originally.